WHEW!! It has taken me six days (not as fast as I used to be), but I have sorted through and put away most of my belongings. I am now in the process of starting to do some decorating. After seven years of not having a home of my own I am loving every minute of it. Okay, all the bumps and bruises and a possible broken toe haven't been fun, but they will go away and I will hopefully be left with a space that is all mine. I just shooed them on their way and told myself that I never give up. However, in this case I thought I might have to call in a furniture restorer, which I definitely can't afford. I fixed myself a calming cup of tea, pulled up a chair, and studied it. Thank goodness for my good mechanical skills. After pulling out all of the shelves, I figured out which peg went into which slot and got them started on their way. Once I had that done I lifted the bottom piece, and with a hammer I lightly tapped it into place. Voila!!! The entire cupboard just slipped back into its rightful place. Once I had all of the shelves back in it was as sturdy as could be. Time to start decorating. First thing I did was place the remains of my childhood rocking horse on top. It is over 60 years old and has seen a lot of use, but looking at it makes me smile. I had originally planned to put the cupboard in my dining area, but it was just too large, so my fall front desk is in there. I'll show you that another day when I have it ready. 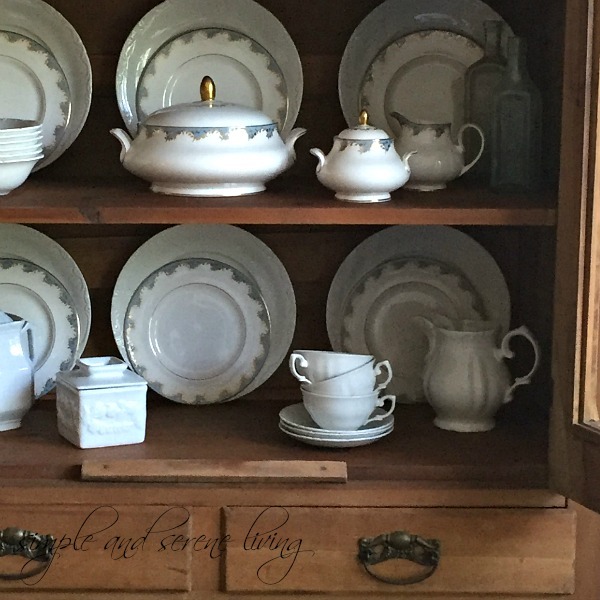 For now I am using a combination of pieces, including some of my white vintage china, white ironstone, and some of the blue and white Dalton china that my father gave my mother when I was growing up. 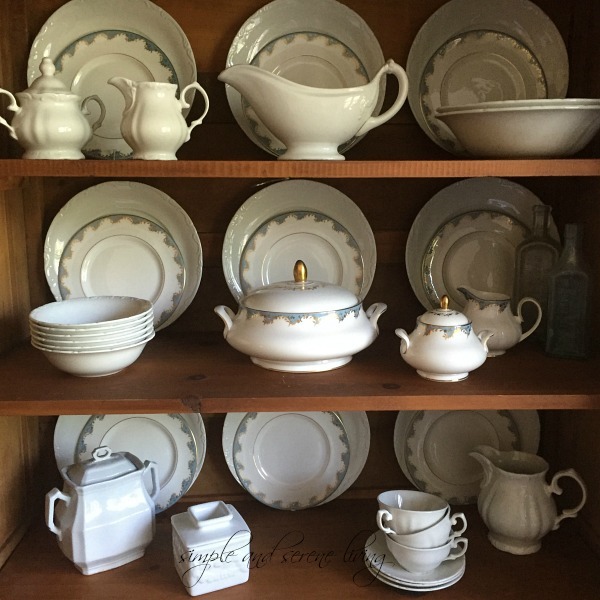 My mom gifted the china to me several years ago and I loved pulling out all of the pieces that I had packed away and stored in my sister's garage. I am so happy to have my cupboard back. It fits perfectly into my small space living room. 540 square feet is more than adequate for my needs. Now the only thing I need to do is replace one piece of glass that was broken and I will be done with this project for the time being. Believe me, I have plenty more to do. It is so much fun being able to decorate again, and I will definitely be sharing it all, so stay tuned. This also means I will have more time for visiting. Hooray!! Laura, I am so excited for you! I know how it feels to have your own things in your own home and to make it you!! 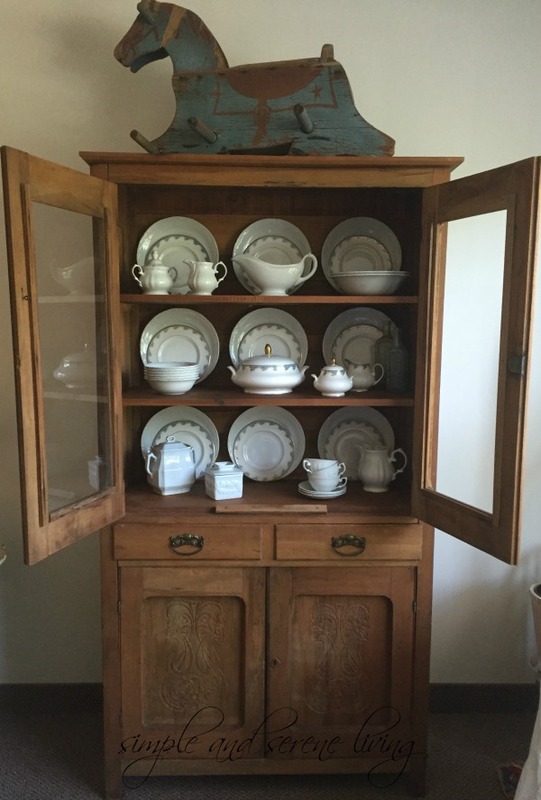 I love your cupboard and I'm so glad you were able to bring it back to life. Enjoy the decorating. Thanks, Linda. I am so happy to be in my own home. The old saying "there's no place like home" is so true. All the sweeter for the fact that you returned the cupboard to fresh vitality, with your own hands! Thanks, Diana. I am so happy to have it back in my home. Laura so happy you could get the cupboard back together. It is a beauty. Love how you styled it too. That rocking horse made me smile. It is looking so great. I am so happy you are getting settled. Life can be so hard sometimes but also rewarding too. Glad you found home again. Laura great piece to still have from when you were young. Happy you were able to save your cabinet. It's fun getting back to posting isn't it? Bringing something back to life is so much better than replacing it with new, and it looks beautiful. I'm so happy for you . . . now you can feather your nest and create a home that reflects your spirit. I love the cupboard! Old pine is so homey and speaks of the history it had and will have. It sounds like you are feeling better too, which is a good thing. How fun and sweet to be able to make your own little nest once again. I'm looking forward to seeing what else you do to make your home "yours".... so happy for you! 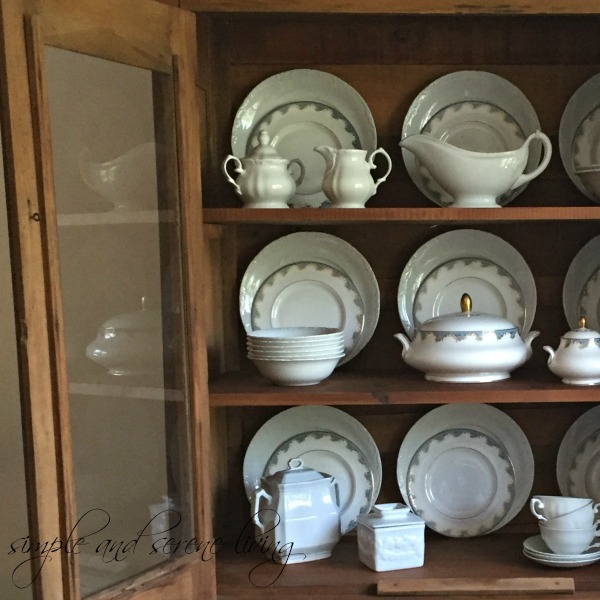 I love the cupboard and your dishes look beautiful in it. 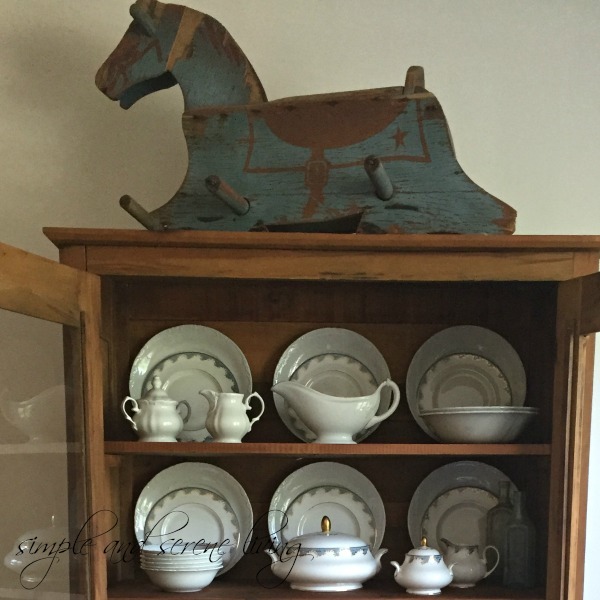 Your pine cupboard is a beauty and I am in love with your rocking horse! I am happy that you now have your very own nest and wish you every happiness in the days ahead. Keep showing us pics of your progress as I really enjoy seeing your new home. I know you are having a good time unpacking all the things that you haven't seen in so long. It probably feels like Christmas! I love your cabinet. So glad that you were able to fix it. It looks perfect! I love the rocking horse on top too. It's so unique and looks great there. Glad that your toe is better. I am absolutely beyond excited for you, Laura!! There's nothing like being able to unpack and settle into your own home! I love that cabinet, and I'm so glad you were able to repair it yourself - those kind of pieces are just treasures, aren't they? Can't wait to see more of your new home - enjoy it, my friend! The hutch looks wonderful. How great it was of you not to believe those who didn't believe in it! You brught it back to life and it looks so pretty with all your dishes displayed in it.